I dun no whud she do wit her chicken tetrazzini…. I’m not going to link the longer clip (just look up “chicken tetrazzini” on youtube if you’d like), but be warned it’s NSFW. Or children. Or your sanity. So, where were we? Oh yes, chicken… chicken tetrazzini. Despite the fact that The Soup has pretty much made this dish a joke in our household, it is DELICIOUS. And it’s easy to make ahead of time, freezes nicely and travels well. The recipe came from Wino Emily and she’s made it for us on many occasions. When I was getting married, I had a kitchen/recipe shower and this was the recipe she gave me. It makes a lot – you could do either one big lasagna dish or 2 small 9×9 dishes. I did 2 small ones, so we could eat one and give one away. I again used my big serving of pre-cooked shredded chicken for this one. 1. Cook and shred chicken. 2. Cook noodles according to box’s directions. 3. Mix soups, sour cream, and salt and pepper. 4. Saute onion and green peppers. Add mushrooms. 5. Add noodles to soup mixture. Stir/toss (it will be very thick.) Add sauteed veggies and chicken. Pimientos are added last so they don’t color the sauce. 6. Place in a greased dish. Top with cheese. 7. Bake uncovered at 350 for 1 hour or freeze uncooked to be baked later. I actually made a double batch to have some more for our freezer, and it was so big I had to get out my giant salad bowl to mix it in. I forgot to take a finished product picture, but to be honest – it’s not the prettiest dish. You’re just going to have to trust me that it’s a crowd pleaser and easy to boot. It’s obviously a pretty calorie dense meal, but a small serving goes a long way. Pair it with a simple side salad, and you’ve got dinner – for a few nights or for a big group. Or, to seduce your best friend’s boyfriend. The next few day’s posts will be featured in one post at the end of the week explaining how I cooked *all* these meals in one day. Yea, I’m superwoman. No big deal. The only thing better than spending an entire day touring Sonoma vineyards… is doing it twice in a row. Thursday dawned, and we were awake (again) to see it. Although I think we slept in til seven this time. By the time DJ, our driver, had backed the Suburban up the long, windy driveway we were ready and waiting for our second day of tours to start. We started off at Benzinger, which included a tram tour. Personally, I had a bit of a rough day – criss-crossing the rough terrain of northern California in the back of an SUV left me car sick for the first time in my entire life! When we pulled up to Benzinger, the only thing I wanted to drink was a Sprite out of the vending machine. Unfortunately, the car sickness stuck with me through the next 3 places so I can’t tell you much about the wine, just about the vineyards. Benzinger was awesome, and definitely a place to go if you ever go out to Sonoma. The tram tour was educational without being boring. We got a tour of the grounds, and they explained their biodynamic garden philosophies which were really incredible – it’s obvious they’ve put a lot effort and money into making their vineyards a sustainable place and I think their success speaks to the idea that you reap what you sow And they sow some yummy grapes. While I didn’t try any that day, fortunately I found a bottle of Benzinger Chardonnay at my local Total Wine when I got back and it was every bit as yummy as my friends had promised. I’ve always bought wines based on the label (and the price), but understanding where wine comes from and how it grows, and how things like soil, or climate or lifespan affect the grape and thus the wine appeals to me in the same way that understanding where food comes from and how it grows. I don’t fancy myself ever becoming a wine snob (although I do catch myself swirling and sniffing on a regular basis now….) but I like understanding things, and knowing why I like what I like and why I don’t what I don’t. I like understanding what maloactic fermentation is, and that a peachy fume blanc doesn’t really have peach in it. After Benzinger, we went on to Chateau St Jean which was one of my least favorites of the day – it was more your typical chateau-y looking vineyard. Then our driver asked us if we would be okay going to a really unique place that was a reds only… and I was ready to take a breather (since I’m not a reds only kinda gal), so we went on to Kaz. Kaz was an experience. According to the red drinkers, it was not the best wine they had all week, but the experience was totally unique, in that the wine came straight out of a barrel into your glass or bottle. After Kaz, we went on to a place called Family Vineyards. Pam and I had actually taken this off our list, because it looked like it was just a house on the road that represented five or six vineyards – and no actual vineyards there. I ended up being very glad our driver had put it back on the list. First of all, our pourer Stephanie was hilarious… she entertained us to no end. I had made a spontaneous recovery from my car sickness and was ready to taste again. Lucky me, because Family Vineyards ended up being home of the Sparkling. I love me some sparkly stuff, ya’ll. Since we were the only ones there, Stephanie tailored the tasting to us – mixing and matching from what she had on hand, diverting from the actual tasting menu – I had three white sand three sparkling, while some of the other girls had more reds, roses and just a few sparklings. I had two sparklings there I had never had – a raspberry flavored Framboise and an almond flavored Almonide. I bought them both to bring home, they were that good . Stephanie also had us do a few “experiments” – drinking a Zin, eating a piece of dark chocolate and trying the Zin again to see how it tasted, and then repeating that with a Late Harvest. Listen, any place that’s going to combine chocolate in its tasting experience gets two pinkies up from this girl. After Kunde, our driver sat in the parking lot deliberating something… then pulled out his cell phone and made a quick call. “Ok, we’re in” he said, explaining that the next place we were visiting was rather picky about large groups and often turned down drivers with groups. When we got to VJB Cellars, I couldn’t help but feeling like The Godfather himself had waved us into his home. VJB was owned by a sweet little Italian gentleman who regaled us with stories of Italy, wine and “the familia.” Even though I’m not a huge fan of reds, I drank every single taste he poured… I’m not sure if it was out of respect or fear! I ended up buying his Primitivo to bring home to Matt. We stayed there until the sun set and until our lovely host, Vittorio, had run out of stories. Dinner on Thursday night was shrimp and salmon on the grill by Emily, fried goat cheese salad by me and molten lava cakes by Jenny. We did not hurt for calories that evening, let’s just say that. We had a bottle of Prosecco from VJB Cellars to go along with our dinner. We sat around the table, reminiscing about stories from the ten years we’ve known each other, finishing each other’s sentences and laughing in anticipation as someone would begin rehashing a story we had heard before. There’s no better way to end a day than laughing so hard your stomach hurts and Prosecco nearly comes out your nose (ow) with your best friends. Thank you, Sonoma, for another beautiful day. This was my first time attempting to cook it myself, and I was pretty pleased with the results. (I actually made this on Sunday, but it seems appropriate to post it today.) Then again, you basically just continually add things to boiling water: meat first, then potatoes, then cabbage. Making the sauce involves stirring and microwaving. It’s pretty much a no-fail, and it goes a long way. Definitely can see why my Grandma Claffey (my Dad’s mom) would have been a fan of this, since she was tasked with the challenge of cooking for nine every night! I guess this should go on my cooking blog, but then again, it’s not the healthiest meal I’ve ever made, so between you and me, let’s just agree to leave it here. Did I mention soda bread? Mmmm, soda bread. We’ve been eating this for almost a week now. I love being Irish. Growing up in the North I experienced a big focus on “where your family comes from.” Maybe it’s because the northern states were “melting pots” much more than the South, but I’ve not come across this same fascination with the place of origin in the South. Here, when you ask someone where they are from, they are likely to tell you which county their relatives have lived in for the last 100 years! That kind of longevity of place is a bit of a novel concept for most Northerners. In 3rd grade, we had to make cut out paper dolls to represent our family’s country of origin. I specifically remember using an excessive amount of red yarn for hair, and plenty of freckles. In 4th grade, we had to interview an older relative about their relatives – during this project I learned my great aunt was supposed to come over to America on the Titanic but fortuitously fell ill and couldn’t make the departure! In 5th grade, we had Immigration Day in elementary school. We had to dress up from whatever country our ancestors had come from, and if I recall right, there was a pretend Ellis Island type experience and a swearing-in assembly. Oh, us melting pot of Western European suburban kids! I was very conflicted as to whether to represent my Swedish ancestors (Mom’s side) or my Irish ancestors (Dad’s side.) In the end, I choose Swedish for one simple reason: I was blonde. Other than our somewhat odd fascination with immigration projects from 3rd grade to 5th grade, I haven’t dabbled much in my family’s roots. My brother spent sometime in college tracing my Dad’s line back to Ireland, and my mother’s father has a great record of his family dating back to England. The first time I learned that my Grandma Swales (Mom’s side) had descended from Swedish missionaries who had lived in Venezuela was at her funeral! As I grow older, I find myself being tugged back towards my roots. I know very little about my family beyond my grandparents – which is the complete opposite of my “100 years in one county” husband who can tell tales of a great-great uncle who was a physician who traveled on horseback throughout Lincoln County and a great-great grandfather who was a pilot. It wasn’t until about a year ago, when putting together a family tree in my wedding scrapbook, that I learned that my sister’s name – Kathryn – was my great-grandmother’s name. I know that, strangely enough, this is some of my reason for blogging. Ever since learning my great-grandmother’s name, I’ve wondered who she was. At 27, what was she doing? What did she think? My mom has recently found and shared some writing from my Grandma (her Mom) and there’s something that seems magical about hearing the voice of the people who came before you. Especially, in the case of my Grandma, hearing her voice as a wife and a mother, before she played the only role I knew her as – grandmother. I blog for myself, to shake the voices and stories out of my head, to supplement my not-so-trusty memory, but also to put my voice out there for my someday children or their children to read and know who I was, before I play the only roles they will know me in. Isn’t that the fascinating thing about people? We play so many roles in our lives, yet we generally only know each other in one or two of them. Maybe it’s the process of beginning to start a new branch of a family tree – getting married, the joining together of two families – that makes the desire to know more about where you come from grow stronger. Maybe it’s totally random. What do you think? Do you know much about your family line? Have you ever been curious to know more? Where would you start, if you wanted to know? Who knew a blog on boiled cabbage was going to end up being a soliloquy on immortalizing my own voice? I think I forgot to mention another reason I blog: it turns out I can, and will, talk about anything I want. Happy St. Patrick’s Day, from a 25% 5th-Generation Proud to Be Irish Woman. Although, you should know, that’s just one of my roles. Oh, weekend. You could not have gotten here any sooner. I usually don’t feel that way… my weeks often go by so fast, the Friday afternoon almost catches me off guard. This was one of those weeks that somewhere around Tuesday I was like a lil kid sitting in my front window just waiting for Friday to show up. Just one of those weeks. Friday night we had a very casual dinner at La Carreta with Zac + Jamie, and Matt + Donna. I don’t think I’ve been there since college… but it hadn’t changed a bit. Same wait staff, same cheap pitchers of margaritas, same never ending chip basket. After dinner, we went downtown and Donna + I accompanied Jamie on a walk around the art district to complete her night photography assignment. The boys busied themselves with the drafts at 6th & Vine. I had taken my camera card out to upload the day before, and for the 2nd time that week, had forgotten to put it back in. So I’m waiting on you, J-boo, to live vicariously through the awesome night pics you took! Saturday night we got together with a bunch of the other Emergency Medicine interns and their wives for a wine and cheese party. The premise was simple: bring a wine and a cheese to share and sample, but the outcome was superb. (I think there’s few comestibles I love more than wine and cheese, so I’m fairly easy to please.) Our hostess, Kim, went out of her way to make some other tapas, including an asparagus-prosciutto combination that Matt and I were still talking about 24 hours later and a fiery Spanish tomato dip called Romesco. Imagine my envy when Kim described a 2-week cooking experience in Spain she and her mother had attended. Oh my sweet heavens. Who wants to send me? I regret that I didn’t get my camera out, because the food was simply gorgeous. (It tasted amazing, too, which I suppose is equally as important to non-food bloggers.) I still feel a little hesitant to whip my camera out and start photographing food in places other than my own kitchen. Sunday we headed down to visit with Matt’s family and celebrate the March birthdays, including my mother’s-in-law tomorrow. Matt’s aunt was in charge of the cooking, which was as delicious, abundant and Southern as any family gathering could hope for. I consider myself very fortunate to have married into a family that is as loving, welcoming and accepting as the one I was born into. I know this isn’t always the case, and any time I listen to a girlfriend tell a “mother-in-law” story, I send a little thanks up to my lucky stars for giving me such a wonderful second family. Matt’s family lives about 90 minutes west of us, but it doesn’t take 10 minutes of being on the highway before I am sound asleep, every time. There is something about good food, warm homes and cozy conversations that knocks me out every time. It doesn’t take much to put me back together after one of those weeks: a clean home, some yummy food, and time well spent with friends and family. It’s my very ctrl + alt + delete button that gets me ready for another Monday. It’s always something of a gamble, telling your friends about your favorite eating establishment. For most people, part of what it so delicious is the nostaliga that is so intricately woven into the flavors of the food that you begin to lose the ability to describe what exactly it is that makes you love it so much. I always feel this way describing Pontillo’s, my hometown’s local pizza place, because I know that it’s magic is one part grease puddles on curled up pepperoni’s and one part memories of ordering pizza at everything from slumber parties to after-prom parties. When we first met our friends Zac and Jamie, they would tell us about this place they loved to eat in Utah called “Cafe Rio.” To me, it didn’t sound like that big a deal. How much different could it be then Q’doba or Moe’s, or any of the other countless Mexican restaurants that we have in Winston? I mean, c’mon. It’s a burrito, not your first love. When we first flew out to Utah in 2008 with Zac and Jamie, Cafe Rio was on the to do list. When we flew out to Utah this week with Zac and Jamie, I made it abundantly clear that I wanted to visit Cafe Rio, not once but twice. They happily obliged, grinning ear to ear, knowing that Rio had another victim, hook, line and sinker. Guys, I’m sorry for any shred of disbelief I ever held about its deliciousness and I’ll be taking a vat of this creamy tomatillo sauce home in my carry-on now, thanks. How can a salad be so very magical? Don’t mess with this guy. That’s an empty burrito tin there. Since my foray into the world of fudge making did not go so well, I was quite glad that I did indeed have a back up plan for my Dad’s Christmas present (besides the photo calendar that we do every single year and neither parents ever seem to tire of. Hooray for Snapfish!) One day, while digging in my pantry for a rub I had made awhile back and wanted to reuse, I got the idea to make a batch of rubs for my Dad, who is the ultimate grill-master. And what goes better with a meat-theme gift than beer? I decided to put together a gift basket of 5 different homemade rubs and 6 different types of beers, sold as singles at World Market. I got the spice jars at World Market as well, and looked up different rub recipes online and in cookbooks that I had. This also turned out to be a great way to use up spices, since I seem to have some that harken back to my Baltimore days. Five years ago. Woops. Fortunately, I had much more success with the rubs and beer than I did with the fudge. This was incredibly simple, and I would encourage anyone with a meat eater on their gift list to give it a whirl. Don’t forget the brewski basket: every good grill-master needs something to wash his steaks down with. The following criteria deem you “Difficult to Shop For.” If you match at least two of these criteria, you should know that your friends and family are probably talking about you behind your back circa November 25th each year. 1. You say out loud that you want something, and then you go and buy it. 2. You have no poker face when it comes to gifts that do not appeal to you. You have no qualms about asking for a gift receipt for returns. 3. You give few hints or lists around gift giving time. 4. You are astoundingly good at giving presents. So here is what my dad DOES like, as far as gift giving goes: gifts that clearly demonstrate your generosity of time and thought. Gah, I mean, what kind of holiday is this? My dad has always been a fan of gifts that we have made: whether it is a photo calendar or a CD of music we think he’ll like, if we made it, he likes. (Although I may have detected a hint of anxiety when I went through my knitting stage that he might be on the receiving end.) And his absolute all time favorite gift? Homemade fudge. Yes, homemade chocolate fudge is all it takes to make my Dad happy. So when I was home for Christmas, I decided to attempt making it. The recipe comes from my Grandma (his mom) and looked fairly simple. Famous last words. All was going well through the early stages: scald milk, melt chocolate, add in a few things. But then there was the boiling, and the soft ball stage and the dropping the pan into a sink of ice water. First, my pot was too small. For the record, it should not be doing this Mount Vesuvius action. That is very, very bad in the making of fudge. I was so flustered by the gushing chocolate over the sides of the pan that I underestimated the soft ball stage and switched to the ice bath too early. It is supposed to go from a very glossy melt-y chocolate look to the matte look of, well, fudge. This did not happen. Nonetheless, I prayed for the best and poured it in the waiting pan and stuck it in the fridge. My mom told me to stick it in the fruit drawer, swearing my Dad would never look in the fruit drawer. Later that night, my Dad mused out loud that he wished someone would make him fudge and my mom and I traded conspiratorial glances. A few minutes later, he was rummaging in the fridge for something when… “WHAT THIS IN HERE?” The jig was up. So much for waiting for Christmas. As my Dad dug the tray out of the fruit drawer, I crossed my fingers and toes that the fudge had set while in the fridge. For dessert that night, we had vanilla ice cream…. with melty, gooey hot fudge sauce. I had fun planning the menu, trying to do a fairly traditional holiday dinner, but not get too in over my head. My favorite thing to make was the homemade yeast rolls. They were super easy, but I felt very Pioneer Woman tossing flour all over the place and pounding rolls into little balls to drop into a big ol’ greasy pan. I won’t go all play by play of the food on you here (holding myself back) but the rest of the meal was quite scrumpty too. Okay, wait indulge me one more… for my male readers… I’ll mention the meat. My first time making a prime rib! It was perfect. I got a little nervous when I realized my meat thermometer, which has worked faithfully for four years, broke. TODAY. Of all days. Couldn’t have broken when it was just me and Matt and I might be worried about a little trichinosis from undercooked bbq, ooooh no, thermometer you had to break on my very first Holiday Dinner with The In Laws. (Well… at least my napkin rings were pretty, right?) Without any other choice, I just followed the timing and temperature in my recipe (from Everyday Food) and prayed for the best. I breathed a sigh of a relief when Matt started carving and the meat was not still moo-ing. Not moo-ing, and very very tasty. Success! Thank you oven gods! I ran into a little snafu handling Matt’s gift. I had gotten him part of one of those heavy duty Craftsmen tool chest, which was very kindly loaded into *his* trunk by the Sears sales guy. I got home and went to get it out to wrap and it, um, well… looks like I need to go back to doing some 30-Day Shred. Couldn’t even move the darn thing. Soooo I wrapped it right in the trunk and prayed that he would have no reason to go into his trunk for the next 2 days. When it came time for unwrapping his gift, I forced my family to tromp out to the garage together. Nothing like the smell of gasoline to get you in a festive mood, right? On that lovely note, I leave you with this… Merry Christmas, from the Cline family. May your meat be cooked, your presents clock in at less than 75 pounds and your family be together this holiday season! I am not crazy about this sudden flash of cold weather… BUT it did give us an excuse to put our firepit to use this weekend! S’mores galores. Confession? Matt and I gave it a test run Friday night with round one of making s’mores, and then made more s’mores AGAIN on Saturday night with friends Zac + Jamie and Donna + Matt. If that’s wrong, I don’t wanna be right. The key to a good s’more is prep work. I like to lay out the grahams with chocolate ready to go at moment’s notice. Then when the ‘mallo is just right, you’ve got the perfect surface to smoosh it on. It’s all about flame control. Finding the perfect spot. Until it comes together… the long-awaited reward! Delish. I wish I drank red wine solely so I could purchase this bottle. 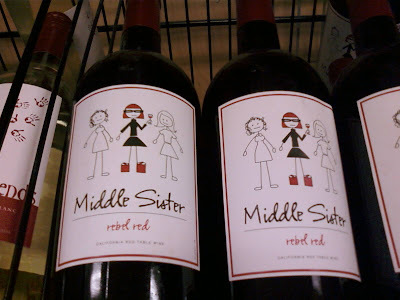 I love judging bottles by their labels. Any bottles you’ve bought based on labels that have turned out to be success? My two faves so far are Barefoot Pinot and Polka Dot Riesling.